Once again we've partnered with WoWTCGLoot to bring you another great vanity pet loot pre-sale! The Purple Puffer is the new Throne of the Tides common loot featuring a completely unique model: a puffer fish in a bubble which floats at your side. The TCG expansion is due out in stores October 11th (next Tuesday). Why Pre-Order the Purple Puffer? Rare Pet Loot Prize - Everyone who pre-orders a Purple Puffer will be entered into a random drawing to win a rare [Soul-Trader Beacon]. Limited Supply - We have a limited supply of loot codes available for preorder on a first-come, first-serve basis. Order today to secure your new pet and your entry in the Ethereal Soul-Trader loot giveaway before supplies run out! The pre-sale will run through Tuesday, October 11, 2011. 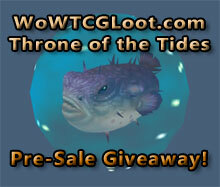 If you have any questions regarding the pre-sale or loot giveaway, please contact WoWTCGLoot. NOTE: It's possible that the Purple Puffer may not be redeemable until patch 4.3 goes live. However, Cryptozoic (the game manufacturer) is doing what they can to prevent the loots from being delayed until then.